Crime Watch: Joan Druett on the cover of Alfred Hitchcock's Mystery Mag! Joan Druett on the cover of Alfred Hitchcock's Mystery Mag! 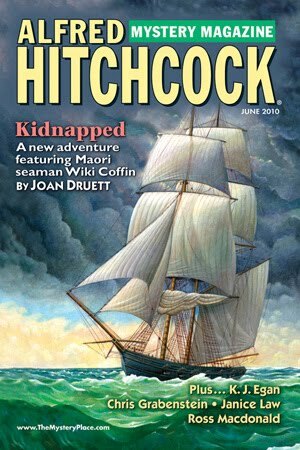 Not only does New Zealand historical mystery writer Joan Druett have a short story in the current (June 2010) issue of Alfred Hitchcock's Mystery Magazine, it is her story featured on the cover. As I've noted before, for over fifty years, Alfred Hitchcock’s Mystery Magazine has been one of the foremost publishers of mystery, crime, and suspense short stories. AHMM each month publishes mystery fiction of the broadest range and the highest quality, featuring every subgenre of mystery fiction. Several of the biggest names in crime and mystery writing have contributed over the decades, and stories published in AHMM have won dozens of writing awards. Quite simply, AHMM is one of the premier publications anywhere in the world for short story writers. Since first falling in love with maritime history, Druett has written 18 fiction and non-fiction books. You can read the first chapter of DEADLY SHOALS, Druett's most recent Wiki Coffin mystery novel, HERE. The Wiki Coffin series includes four novels, and now three short stories (that I know of) that have been published in AHMM. According to the AHMM website, in the June issue "We also celebrate the return of another popular character as Joan Druett fills in some details of the personal history of Wiki Coffin, her Maori translator and investigator in the Age of Sail; in "Kidnapped," Coffin employs his deductive skills while he waits aboard ship for his captain to complete his jury duty." Druett's cover-featured short story is one of seven brand new mystery short stories in the June 2010 issue of AHMM (along with a classic mystery short story, "Sleeping Dog" by Ross Macdonald). So it looks like a great issue to get your hands on. Well done to Joan - she is a very humble, quiet Kiwi who makes a big splash with her writing achievements off-shore, but doesn't draw attention to herself. Good on you Kiwicraig for keeping us informed.